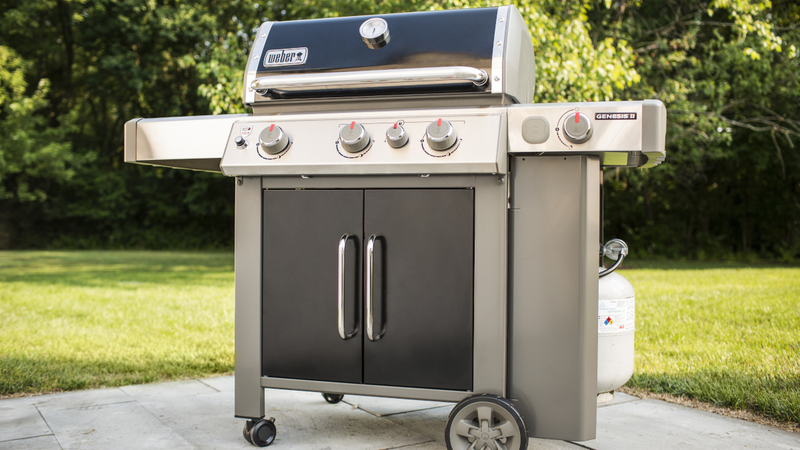 The Weber Genesis® II E-335 Gas Grill features a sear station, a world class grilling engine, a tuck-away warming rack, stainless steel side tables, tool hooks, and a side burner. Total Cooking Area: 669 sq. in. The three burners feature 39,000 BTU-per-hour input, and deliver a consistent gas flow from front to back, ensuring that your food grills evenly wherever you place them on the cooking grates. The Infinity Ignition is guaranteed to ignite every time. The two Stainless Steel Side Tables give you plenty of space to keep your food, seasonings, and tools within arms reach. You can hang tools on the hooks attached to the side table, freeing up additional table space. The Grease Management System helps to prevent flareups by funneling away drippings from the burners that are not vaporized by the flavor bars into a removable catch pan.